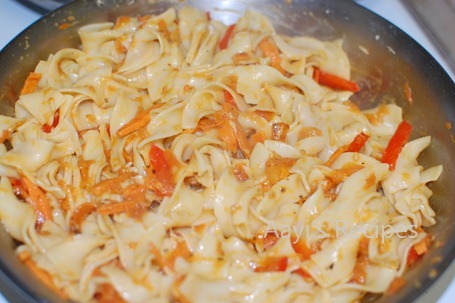 Lately I have been getting lot of emails/comments requesting me to post pasta recipes. My son is 11 months old now and likes to eat only the things that he can pick up from his fingers. At his daycare, they encourage him to eat by himself. Even though they provide food, I pack his lunch. 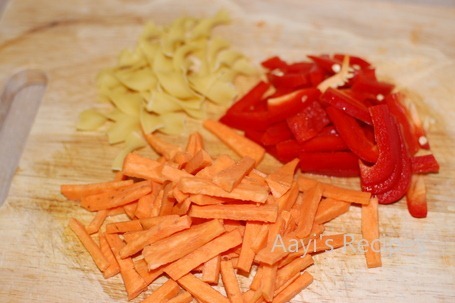 I usually send pastas loaded with vegetables or parathas. I have used different pastas in this recipe. 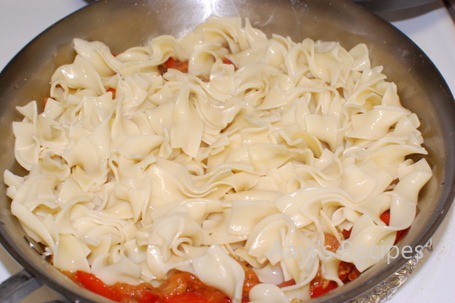 I have tried egg noodles, small penne pasta, farfelle, macaroni etc. I usually buy whole wheat pasta. I cook the pasta till it is soft, so that he can eat it easily. I use different vegetables to make it taste different. I used to buy marinara sauce earlier. Then I asked the expert. And as usual, he did not disappoint. Pelicano gave me a very easy recipe for marinara sauce and I have stopped buying the sauce ever since. Never knew making this sauce was so easy. I usually make the sauce once a week and refrigerate it, since I have not attempted canning so far. Here is how I make the marinara sauce – Bring a pot of water to boil. 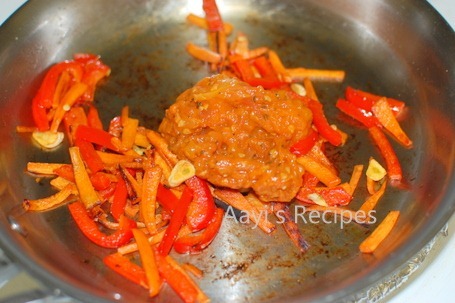 Add tomatoes in it and leave for couple of minutes. Then take them out of water and peel them. Break the tomatoes with fingers. Now in a pan, heat a little olive oil. Add a clove of garlic and cook it for a minute. Do not burn it. Add the tomatoes, dried basil, pepper, a little sugar (optional, was not in original recipe, I add it sometimes for my son) and salt. Cook till the sauce thickens. Cool to room temperature, then put in a air tight container and refrigerate. In a thick bottomed pan, heat butter or olive oil. 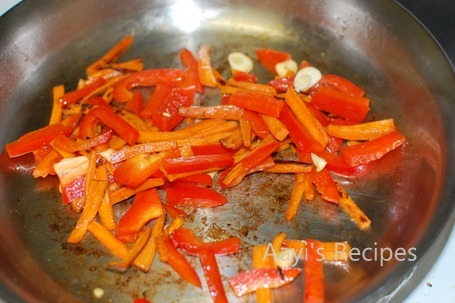 Add the vegetables, garlic, stir fry till they are soft. Now add the marinara sauce, mix well. Add the pasta and mix. Spread cheese (optional). I usually do not add cheese for my son. Thanks for this recipe…..Looking forward to see baby food friendly recipes often….. Thanks for this lovely recipe. My son is 2 years old. I should try this one for him. Nice to know that Ishan is eating food by himself. Hi , loved the pasta pics . Can u also post a recipe of lasagna ? thanks so much……. Very nice recipe! Just a question – can I ask why you don’t add cheese for your son, since I am going to make this for my little one. Depends on how much sauce you want to make. For this quantity, I boil about 4-5 roma tomatoes. 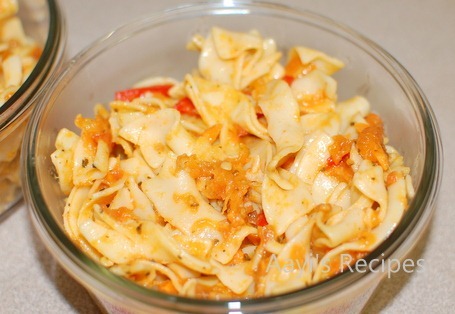 Lovely recipe….I’m gonna make this today..have a packet of farfalle lying in my cupboard since ages…thanks so much for posting the recipe for marinara sauce. I too love making my own sauces rather than buying the ready made ones. Keep cooking & posting your amazing recipes.